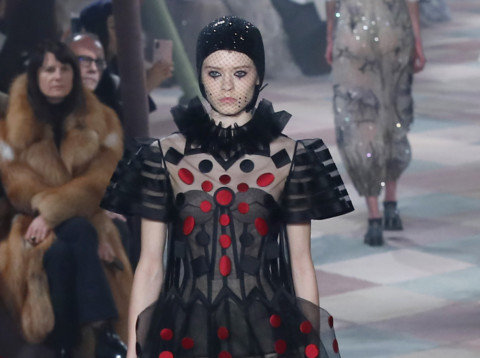 Italian designer Maria Grazia Chiuri took Christian Dior to the circus Monday with arguably her most sublimely balanced collection for the Paris haute couture label. A troupe of all-female acrobats of all body shapes led out the show inside a retro big top — complete with harlequin-pattern floor — built in the gardens of the Rodin Museum in the centre of the French capital. But there was nothing remotely clownish about the muted elegance of the clothes, featuring lashings of embroidery and beadwork, to summon up the spirit of the circus-set 1917 ballet ‘Parade’. Chiuri said she took her powdery palette from the stage curtain Picasso painted for “Parade”, with bolder colours almost having to fight their way through what she called the “fine dust that sprinkles stage clothes”. Feminism was the big theme of the day on the Paris catwalks, with Italian actress and #MeToo campaigner Asia Argento taking a starring role in her Roman neighbour Antonio Grimaldi’s spring-summer collection. While Grimaldi praised her courage and “unconventional spirit”, Argento said that she “loved his sculptural couture”.